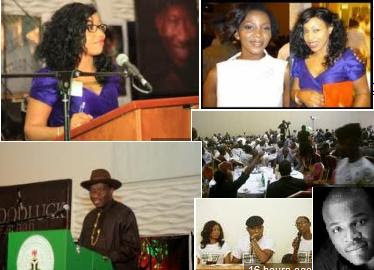 I didn't go to this week's Youth Lunch with the President of Nigeria. I got a couple of invitations by email and text, to which I answered, "how many diners will be at the lunch?" Since I had no assurance that it would be a somewhat exclusive lunch - you know, eba and egusi soup with orange juice around the table with Mr. President - and not a rowdy carnival with us jamming to D'Banj music, I decided to respect myself and save my money. 1. I turned 30 this month. I declare myself a retired youth. Since I am older than 2/3 of Nigeria's population, don't you think I ought to be considered a full-grown citizen and not part of an age-deficient interest group? In some villages, I would already be a young grandmother. 2. The small money I have should not be spent "entering moto" to attend frivolous events. That said, I was sure they would "share money" at the "lunch" and this would just be embarrassing. I am too broke for jokes. Yet I don't feel like joining the mindless feasting on the Nigerian treasury. You see, this President embraces all interests groups, with a wide PDP umbrella indeed. It's just that I want to be loved differently. Not with jollof rice, Naija music, and transport fare, all of which last a short time, but with good policies, more megawatts, and a working government which will last for generations. I found this months ago in the e-book From Dictatorship to Democracy. Each morning, the old man would assemble the monkeys in his courtyard, and order the eldest one to lead the others to the mountains to gather fruits from bushes and trees. It was the rule that each monkey had to give one tenth of his collection to the old man. Those who failed to do so would be ruthlessly flogged. All the monkeys suffered bitterly, but dared not complain. One day, a small monkey asked the other monkeys: "Did the old man plant all the fruit trees and bushes?" The others said: "No, they grew naturally." The small monkey further asked: "Can't we take the fruits without the old man's permission?" The others replied: "Yes, we all can." The small monkey continued: "Then, why should we depend on the old man; why must we all serve him?" I'm reading Great Scientists, a "children's book" by Victoria Sherrow. Bought this one years ago as a gift to my sisters, learning a lot these days reading its biographies of Pauling and Einstein, Oppenheimer and Fermi, Compton and Goddard, and a couple of biology researchers named Thomas Hunt Morgan and James Dewey Watson. No chics on this list. No chics on the list of Nigerian governors either. On Thursday, I attended this year's speech and prize-giving ceremony at my alma-mater, Queen's College. Those students are the females who will someday make those lists. What was special too, was that I live-blogged the event for my classmates. A summary will appear in the paper soon (Update: read online). Nuhu Ribadu only received 7% of the vote in the April 16th 2011 presidential election, but no problem, he has already returned to his job at the United Nations. He's visiting Afghanistan as an anti-corruption expert for the UN. I meant to vote for Ribadu but was too busy covering the elections. Maybe I should join the ACN? Even if the political parties are all corrupt, Fashola and Ribadu at least represent the action required for development. You know I work at a news organization, but not as a writer. Well, I wrote something this morning: Arnold Schwarzenegger and Maria Shriver announce separation.